Last week I was lucky enough to have registered for the inaugural lecture for CreativeMornings Boston.CreativeMornings is a monthly breakfast lecture series for creatives and entrepreneurs. Each event is free and includes a 20 minute talk plus coffee! Its roots are in NYC and with the addition of Boston it’s now in 17 cities worldwide. This month’s event was hosted at Workbar and Design Museum Boston. The event started off with a light breakfast and a networking session. 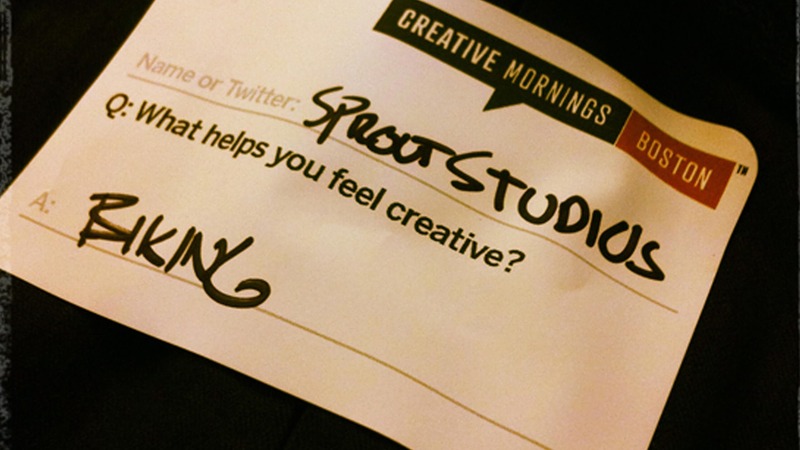 There was great energy from the start as everyone was excited about Boston’s first ever CreativeMornings event. Richard Watson of Essential then discussed his career evolution from humble beginnings working in a chip factory in Yorkshire, England to starting his own world-class design studio here in Boston. The short but sweet 20 minute presentation touched on lessons learned, risks taken and how he did it. After a Q & A session at the end, we gathered our things, said goodbye and headed to work by 10:00 AM charged with inspiration.